How Many Calories Are in 1 M&M? If you have the willpower to have just one M&M to curb your sweet tooth, you won’t get too many calories -- especially if you just splurge on the plain milk chocolate variety. Clearly the more stuff that’s packed inside of M&M’s -- such as peanuts, crispy wafers or peanut butter, -- means that you’ll get even more calories from your tasty morsel. 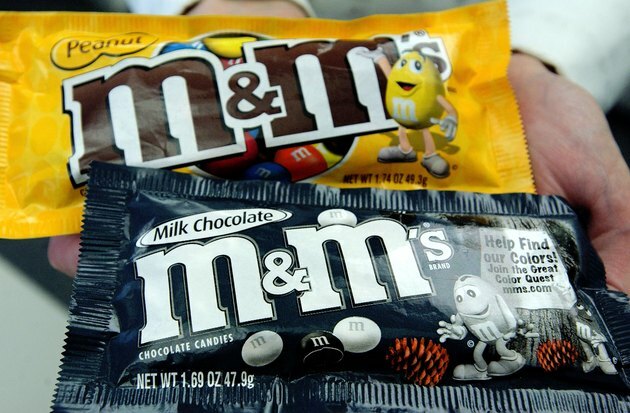 The plain milk chocolate variety of M&M’s has far fewer calories than its filled counterparts. You’ll get just three calories from a lone milk chocolate M&M's. If you have one of the other types though, you’ll wind up with three to four times as many calories. A single peanut, crispy or peanut butter-filled M&M's each provide between 10 and 12 calories per piece. How Many Calories Does a Chocolate Donut Have?